The Canadian Rockies offer vacations where dreams come true. The Rocky Mountains accommodations in both British Columbia and Alberta are world class, the attractions, guided tours & excursions exhilarating! And, the towering Rocky Mountains are an experience of a lifetime. You are at the top of a continent. This is the birthplace of North America's great rivers, where massive icefields can be explored and adventures begin. Let the expedition guides of the Canadian Rockies take you mountain climbing, white water rafting, horseback riding or fly fishing, in BC or Alberta. Discover hiking and mountain biking trails, unparalled wildlife viewing and a wide variety of natural and historical tourist attractions. Tour operators will take you by rail or motor coach to experience some of the most awe inspiring scenery in the world. The accommodations are as varied as your tastes and budget. Choose the elegance of a grand hotel, with fine dining and dancing, or a full service wilderness lodge with its crackly fireplace and hand hewn log walls. Or, make the home base for your Canadian Rockies vacation a modern motel or a rustic cabin in the woods. 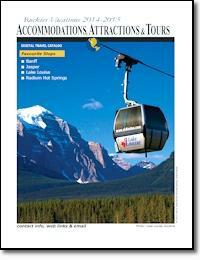 The Canadian Rockies Vacations, Accommodations, Attractions & Tours Catalog is a free trip planning guide for travelers planning a Canadian Rockies getaway.